Strangest of all, this inexplicable threat traces back to a terrifying secret buried a century ago beneath the National Mall: a cache of bones preserved in amber. The artifact was hidden away by a cabal of scientists – led by Alexander Graham Bell – to protect humankind. But they dared not destroy it, for the object also holds an astonishing promise for the future: the very secret of life after death. Yet, nothing stays buried forever. An ancient horror – dormant in the marrow of those preserved bones – is free once more, nursed and developed into a weapon of incalculable strength and malignancy, ready to wreak havoc on an unsuspecting world. With each new discovery, the menace they hunt is changing, growing, spreading – adapting and surviving every attempt to stop it from reconquering a world it once ruled. And each transformation makes it stronger . . . and smarter. Running out of time and options, Commander Grayson Pierce will be forced to make an impossible choice. To eradicate this extinction-level threat and expose those involved, he will have to join forces with Sigma’s greatest enemy–the newly resurrected Guild – even it if means sacrificing one of his own. Thirteen books into the Sigma series and as a reader i always worry how a writer will keep a series fresh, new and exciting and with this type of book where cutting edge is key can they keep it in the realm of believable. James Rollins always amazes me with his ability to write a tight, interesting, action packed story, but most of all his ability to keep coming up with world ending scenarios that are totally realistic. Each and everyone a trial for the Sigma team, to both solve the world ending conundrum and also survive those who are trying to cause the apocalypse. 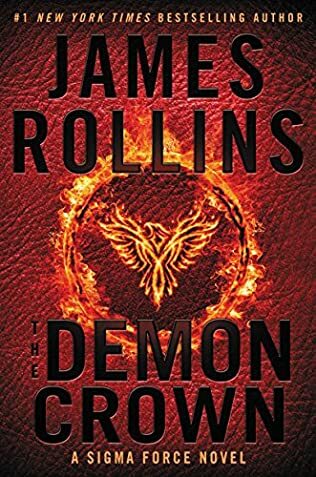 With a Rollins book its not just the roller coaster ride of the thriller that wins me over, its the absolute attention to detail, the huge depth of subject research, both biological and historical, but also arms and armour. These are not cheaply thrown together beach pulp fiction titles, these are the cream of the Action Adventure, thriller world, and year after year book after book he manages to knock it out of the park. Demon Crown is quite possibly one of the best to come out of the Sigma Force stable. Infusing history across multiple time periods for both the cataclysmic event, but also the conspiracy that surrounds the Guild, the latest potential technology for DARPA and similar agencies, a new and ancient, deadly, potentially global event, so simple and yet so complex in its devising that it kept me guessing all the way through the book, set in locations so well described you want to pack your bags and visit. As always the whole thing pulled together by characters who while on the heroic side, they also live , breathe and bleed on every page, making the whole book believable. A full five stars again for this splendid book, just what i hoped for and always more than i expected. I have a question, I’ve never read anything from the author but after reading your great review cant wait to read this one. Do I need to read his earlier works to get some background info or I can jump to this one?.